Daily Illuminator: By Our Powers Combined -- Munchkin Penny Arcade! 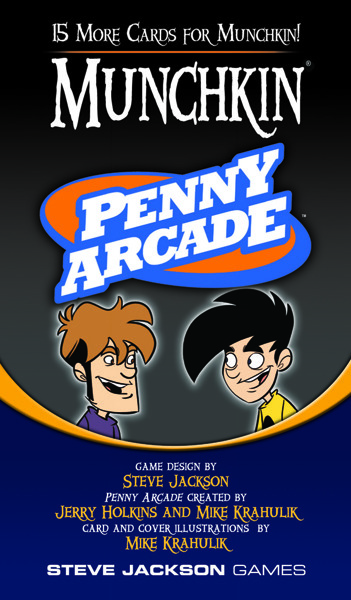 November 18, 2012: By Our Powers Combined -- Munchkin Penny Arcade! Have you ever wondered what the offspring of Penny Arcade and our very own Munchkin would look like? We asked ourselves this question many a time, and apparently so did “Gabe” and “Tycho” over at Penny Arcade. We decided that we just couldn't keep these two awesome things apart any longer, and now you can get your hands on Munchkin Penny Arcade! This 15-card expansion features artwork from Mike “Gabe” Krahulik, while combining the card text by Steve Jackson, which makes it sure to showcase the humor, wit, and artwork you are accustomed to! Pick yours up today from Warehouse 23 or your local Game Store!